Next: Zombie Planter - Grow Your Own Zombie! Whether you're furiously biking through the city, strolling down to the coffee shop, running late to class, or just wandering the Earth for no reason, keep your laptop safe and secured right on your back using this cool new iDesk Laptop Backpack. This ultra slim neoprene laptop sleeve is worn like a form-fitting backpack that can actually be worn underneath a coat. 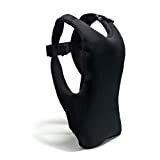 It's constructed from protective, lightweight neoprene and breathable air mesh with a water-resistant exterior and soft inner lining and features a stretchable main compartment that holds a 10-15 inch laptop, an accessories pocket, a shoulder strap pocket, and an adjustable sternum strap. It's not quite a TRON Identity disc and not quite a full-sized backpack, but it's somewhere in the middle of being super cool nonetheless. 7034 Cool New Items Discovered Since The Beginning.